Every product has specific composition of fibres and every product needs an individual maintenance approach. Cotton is one of the most popular natural fibres and is characterized by its high level of resistance. Cotton fabrics are very easy to colour and bleach. On the other hand, they are not very elastic, are easy to crease and do not retain a lot of heat. However, in comparison to other materials, cotton is exceptionally resistant and does not damage even after many washings in washing machine. Cotton can be washed at up to 95°C. 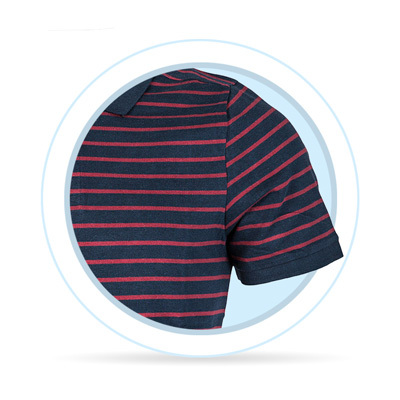 Coloured cotton should be washed only at 60°C and with a special colour detergent to prevent fading. The instructions on a laundry tag should be observed at any time. Cotton fabrics can be dried in a drying machine. 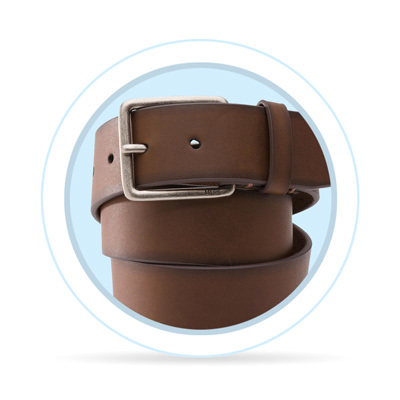 However, be sure to observe specified care for specific fabric type in order to prevent shrinking. Cotton clothes can be ironed on a higher heat level and is recommended to turn them inside out before ironing. 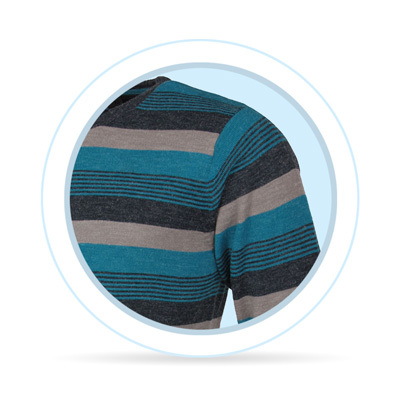 Polyester should be washed at 60°C in order to prevent creasing. Synthetic fibres may accumulate static electricity, which may cause uncomfortable feeling on the skin. In order to avoid this, you can use a fabric. Drying machines are usually equipped with a special program for synthetic fabrics, which dries the clothes with special care. Sometimes it is enough to wrap the piece of clothing into a towel and press it. This way the rest of moisture disappears as fast as if you hang it. 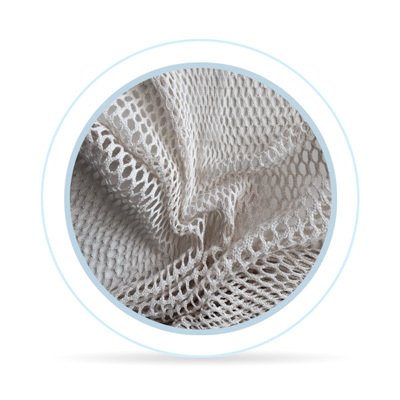 Polyester mesh is very sensitive to high temperatures, so it is highly recommended to wash in cold water and iron under low temperatures from the inside to prevent unwanted sheen. The fabric is very resistant, does not crease much and holds colours. It is flammable and accumulates static electricity. These types of fabrics should be washed at max. 60°C. Synthetic fibres can accumulate static electricity, which may cause uncomfortable feeling during wearing. A fabric softener can be used to avoid this. Drying machines are usually equipped with a special program for synthetic fabrics, which dries the clothes with special care. Sometimes it is enough to wrap the piece of clothing into a towel and press it. This way the rest of moisture disappears as fast as if you hang it. Polyurethane is made from elastomeric fibres, which constitute an essential part of every elastic material. Very resistant, low-creasing and doesn't lose colours. 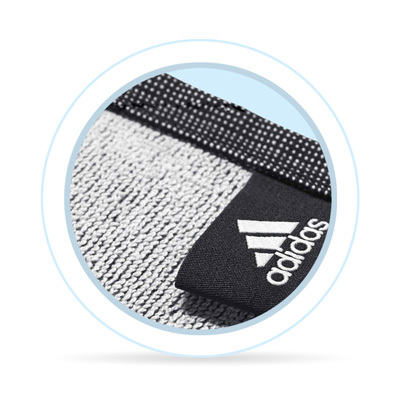 Elastane is used in sports textiles. The amount of elastane in a fabric is usually 20%. 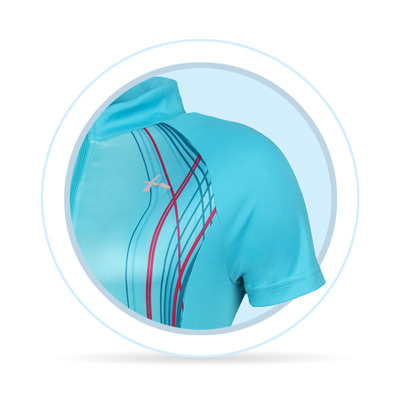 For example, swimwear fabric is made 80% from polyamide and 20% from elastane. Elastane increases the elasticity of material. 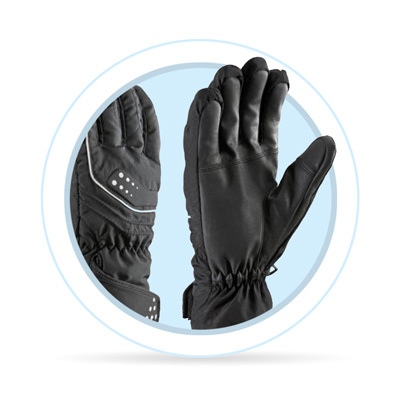 It is a synthetic fibre known for its exceptional elasticity. In the U.S., elastane is known as Spandex. The most famous trade name for elastane is Lycra, however elastane is produced in many countries under different names, such as Dorlastan, Elaspan, Linel etc. Elastane should be washed in cold water and ironed on lowest possible heat from the inside, to prevent unwanted sheen. Very resistant, doesn’t crease and colours don’t fade. Nylon is very sensitive to high temperatures, and so should be washed in cold water and ironed on low heat to prevent unwanted sheen. Very resistant, low-creasing, colours don't fade. It is flammable and accumulates static electricity. Wool is very good at retaining heat and is often used in sweaters or soft winter apparel such as scarves. Wool should be washed at low temperature. Woollen textiles dry fastest when wrapped in a terry towel, carefully pressed to lose retained moisture and then laid on a dry towel to dry completely. 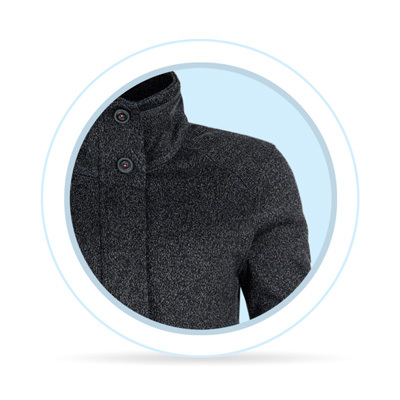 Woollen clothing is ironed on low heat or over a wet fabric. If your woollen sweater gets coarse, put it in a plastic bag and lay it for a few minutes in a freezer. Linen is characterized by its firmness and constancy. It is also not prone to dirt and bad odour, however it creases quite a lot. Hand wash only at low temperature. White and bleached linen may be washed up to 60°C, coloured linen should be washed with special detergents for coloured fabrics at temperature up to 40°C. Linen is best to dry on a dryer and ironed from the inner side in order to prevent sheen, which can however be removed by ironing over a damp fabric. Viscose shrinks during mechanical washing, therefore it is advisable to wash in cold water and iron on low temperature without steaming. Wringing and spin-drying is not recommended to maintain the shape of the clothing. Viscose doesn’t lose colours. It is a soft material, the disadvantage is its flammability and that it accumulates static electricity. 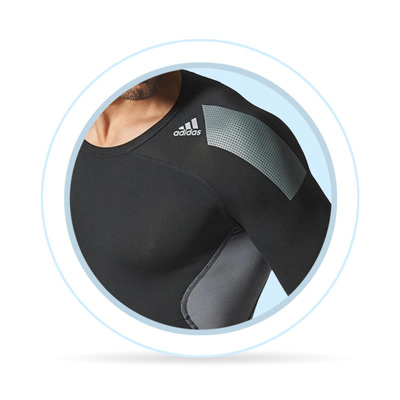 Down has a high volume, it retains heat and provides outstanding thermal insulation, which is why it is often used as a filling in jackets. To keep down voluminous, regular washing is a must. Washing machines usually have a special programme for down washing and a high water level gets rid of all mites. Drying machines are often equipped with a special programme for down. Genuine leather made from animals requires special care. We recommend using a cleaning product on a less visible spot to test if it works properly. Never use any dissolving agents and polish removers. Leather clothing should be drying on a large coat hanger in room temperature, prevent direct sun exposure. Leather clothing should never be put in a closet while still damp, because it may cause a danger of mould. Leather should be iron on low temperature level. Iron from the opposite side over a paper or a dry scarf. Never use steam while ironing leather items. Membrane fabrics are also known as functional fabrics or thermal fabrics. A membrane textile consist of functional fibres which require special care. These fibres may be damaged through bad washing, drying or ironing, and ruin the whole function of the garment. 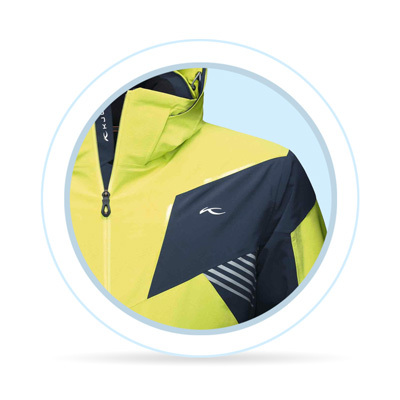 Membrane fabrics are mostly used in sports and leisure clothing, since the breathability properties prevent overheating. 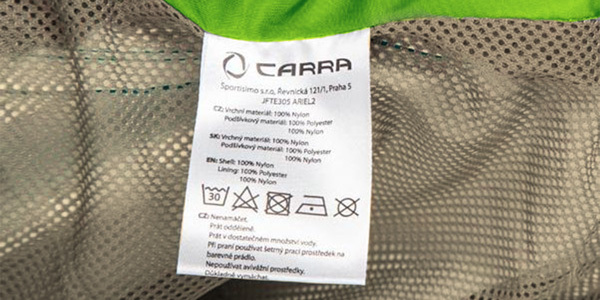 Membrane fabrics are to be washed at maximum 40°C in a special liquid washing detergent. Softeners should be avoided in order to prevent decreasing functional properties of the membrane. It is essential that the fabrics are sufficiently dried and removed of all rests of washing detergent. A short spin-drying is possible even for very delicate fabrics. Washing machines usually include a special programme for fabrics with membrane. Never pierce the fabrics, since it will damage the waterproof properties. Terry products are very absorbent. Terry cloths can be washed at maximum 60°C. First washing should be done at 60°C and the fabric might slightly lose its colours. Drying on a drying rack is not recommended, because the fabric might harden. This can be avoided by drying the clothes in a drying machine. In any case don’t use too much softener, because it attaches to terry fibres and reduces its absorbing properties. Classic blended fabrics are a combination of cotton a synthetic fibres. 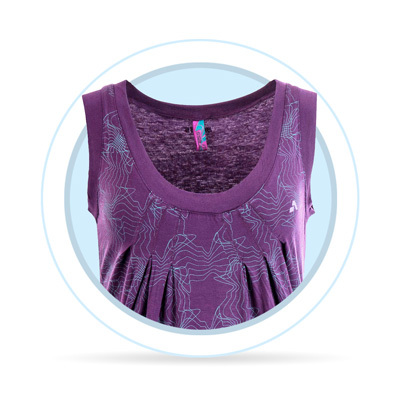 Even microfibers are always a a combination of various materials. 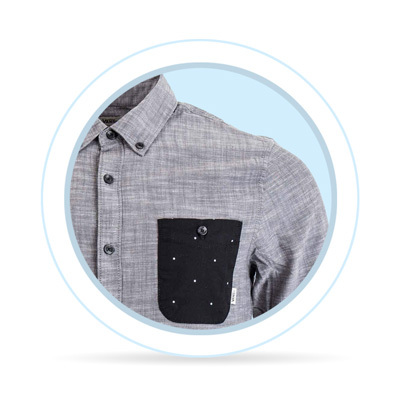 To maintain blended fabrics properly, you should choose the right detergent. When washing, choose the washing programme according to the most delicate fibre in the fabric. Poplin is a fabric used mostly in coats and jackets, but also in pats, dresses, shirts, and blouses. It is particularly dense and glossy version of a cotton fabric, with which it shares its simplicity and durability. Fabric care is also similar. Before washing, remove all dust from the fabric, otherwise it might leave nasty edges. Silk is a lightweight natural fibre characterized by its shine. Silk is very delicate, so the washing must be adjusted to its demanding character. Drying machines often have a special programme for silk, which prevents creasing. Since the fibres are very sensitive to high temperatures, silk should be ironed on lowest temperature while still slightly damp. Swimwear fabrics are made from 80 % polyamide and approximately 20 % elastane (Lycra). Its composition tells us about its elasticity and strength. 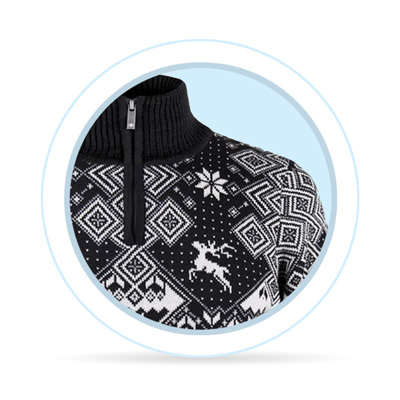 Generally speaking, the more polyamide fibre the fabric contains, the stronger it is. Similarly, with elastane rises elasticity. Each material is unique just like the maintenance should be. These symbols can be found on manufacturer’s label sown onto your clothing. Observing these symbols might prevent damage and prolong the lifespan of your clothes. Maximum allowed washing temperature in Celsius for normal washing. 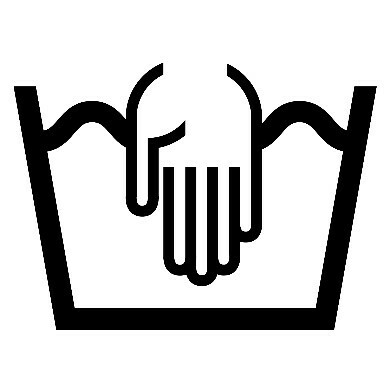 Maximum allowed washing temperature in Celsius for gentle washing. Maximum allowed washing temperature in Celsius for very gentle washing. Item may be tumble dried. Item may be tumble dried on low temperature (under 60°C). Item may be tumble dried on usual temperature (80°C). Item may be ironed at maximum 100°C. Item may be ironed at maximum 150°C. Item may be ironed at maximum 200°C. Any kind of bleach can be used. Dry cleaning with tetrachloride – normal. Dry cleaning with tetrachloride – gentle. Dry cleaning with tetrachloride – very gentle. Dry cleaning with petroleum solvent only – normal. 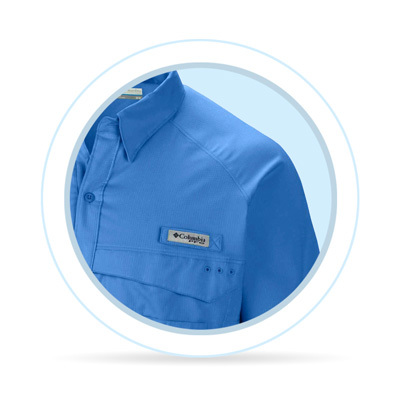 Dry cleaning with petroleum solvent only – gentle. Wet cleaning only – normal. Wet cleaning only – gentle.